Whether it is too hot to cook or you would simply rather be at the pool, summertime cooking begs to be easy. With a few fresh ingredients, a grill, and a versatile, make-ahead dressing, dinner can truly be as effortless as it is delicious. One of my friends mentioned a few months ago that she finally trained her husband not to throw away the random, liquid-filled jars lurking in their fridge. She now places a label on them saying, “One of Ann’s Dressings—Don’t Pitch.” I had to laugh. I now use masking tape for a makeshift label and a friendly warning to my husband not to toss. 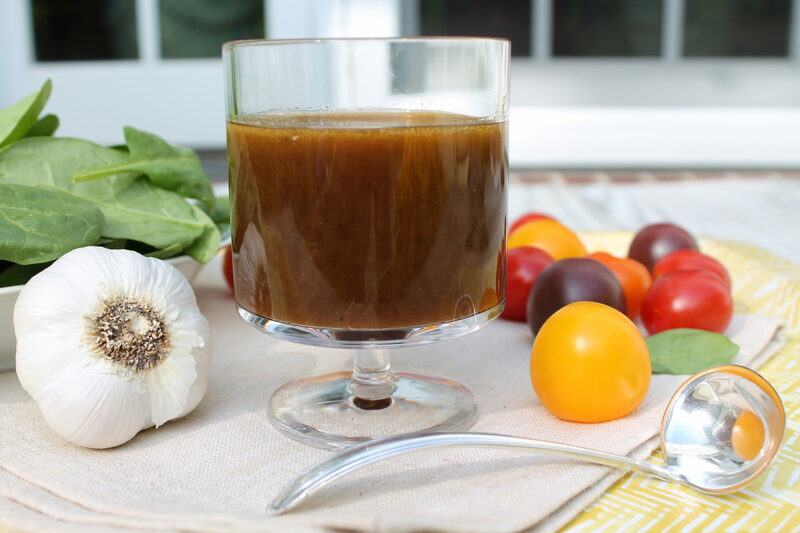 After all, a mere quarter cup of leftover vinaigrette can really enhance dinner! Using feta cheese creates a tasty twist on a traditional Caprese salad, which traditionally consists of tomatoes, basil, and mozzarella cheese. Both versions pair beautifully with a drizzle of balsamic vinaigrette. Converting the salad to a simple salsa and spooning atop the marinated, grilled chicken creates a memorable meal. To avoid wasting ingredients, I recommend using 1/3 cup of the vinaigrette per pound of chicken. This will be sufficient to coat the chicken, and you will not be left with an excessive amount to pour down the drain at the end. I have found this to be a good rule of thumb when marinating any meat for grilling or baking. Place chicken in a large, resealable plastic bag. Pour the vinaigrette over it, seal, and marinate in the refrigerator for at least 4 hours or overnight if possible. I like to flip the bag a few times to distribute the marinade. When ready to eat, prepare the grill. Gently mix the tomato, feta, basil, and a few grinds of fresh pepper in a medium bowl. Allow to sit at room temperature until the chicken is ready. Remove the chicken from the marinade, discarding the remaining marinade, and cook the chicken over medium heat for 7-8 minutes per side, depending on thickness, or until the chicken is just cooked through. Remove from the heat and allow chicken to rest for 5 minutes. If you do not wish to discard the leftover marinade, be sure to simmer it for a few minutes on the stovetop before serving alongside the chicken. Conversely, coat a large skillet with oil, and place over medium to medium-high heat. Sauté the chicken breast halves for 5 minutes each side, or until the meat is no longer pink in the center. Arrange the chicken on a serving platter or individual plates. Spoon the tomato/feta mixture over top of each piece. Drizzle a little balsamic vinegar over the chicken and garnish with extra basil, if desired. Serve and enjoy! Although it is not necessary, pounding the chicken breasts to an even thickness will allow them to cook more quickly and evenly. For added ease, any butcher will do this for you. Likewise, boneless, skin-on chicken is a terrific option if available. The skin will form a protective layer, keeping the chicken extra moist and juicy while cooking. To reduce extra fat and calories, simply remove the skin before eating. As an option to the salsa, feel free to layer sliced tomatoes, basil, and feta—or the more traditional mozzarella cheese—on a platter, drizzling with the vinaigrette and serving alongside the marinated and grilled chicken. When using feta cheese, either in the salsa or salad, pitted Kalamata olives are a flavorful extra that enhance the Greek theme. This recipe is SO good! The marinade is mild yet so flavorful and the topping adds an extra dimension of flavor and yumminess. Will definitely be making again! Thank you, Tonya! We really enjoy this one, too! Made this tonight and it was DELICIOUS!!!!!!!! Outstanding recipe! 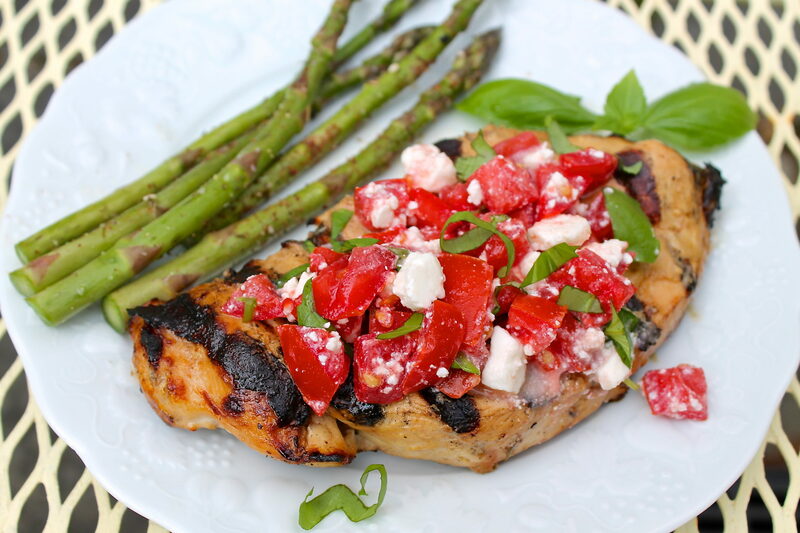 I think that it is worth the extra time to make your homemade balsamic as the chicken was delicious even without the tomato and feta topping (marinated for 6 hours and grilled on a Big Green Egg. I also added a little extra basil. Can’t wait to invite friends over and make this again and again. Thank you for sharing! I’ve been down and out with awful cold and finally feeling better… Going to make some up tonight for chicken to grill tomorrow. Now I have to thaw the chicken.. I hope you are feeling 100% soon…and I hope this recipe hits the spot. Take care, Mary Lou! This recipe absolutely hit the spot Ann! We loved it! So glad, Mary Lou! Thanks for letting me know! The chicken was incredible Ann! Wish I had made more than two pieces for us!